A priceless collection of Etruscan treasures, which includes paintings, statues, busts and sarcophagi, is finally returning to Italy after being found by police at a repository in Geneva in 2014. The treasures were believed to have been stolen throughout the 1970s and 1980s from excavations in Sicily, Lazio, Puglia, Campania and Calabria, before being illegally exported and locked up in the repository by disgraced British art dealer Robin Symes, according to art crime specialist General Mariano Mossa. There were originally plans to sell the pieces on the British, American and Japanese markets, however, they instead remained hidden in crates for decades. The collection is believed to be worth around 9 million euros in total, with the superintendent for Etruria, Alfonsina Russo, saying restoration of these objects could help to shed a new light on Etruscan art and how the people decorated their temples. She also believes that the paintings of divinities, described as “exceptional and unique”, as well as the decorated fragments are from a raiding of an Etruscan temple in Cerveteri, located north-west of Rome, and indicate an initial painting of the temple in the middle of the 6th century BC, followed by a refurbishment at the end of the century. 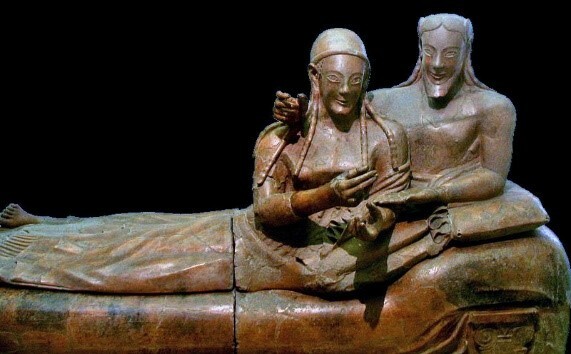 Most of what we know about the Etruscans and the artefacts left behind are housed in the National Etruscan Museum in Rome, with the institution home to some of the only fragments of paintings of Etruscan temples. With the new recovered treasures, historians can hopefully piece together more of the puzzle and reveal more about how the Etruscans lived. Russo added that she hoped the restoration work on the artefacts would take around a year, and that they would also be put on display to the public, whether in the National Etruscan Museum or elsewhere. If you’re planning on discovering the fascinating history of the Etruscans, who once were a civilisation who lived in Lazio, Tuscany and Umbria, there are several museums and archaeological sites throughout Italy which help to tell the story of what we know so far. Book a stay in one of our villas with pools today and immerse yourself in Italy’s long and varied history.